There are a lot of weird superstitions involving the giving and receiving of gifts. However, I was raised in a religious family and taught not to believe in superstitions. All the things that happened to people are probably just coincidence and people strive to make connections. One of them, which I always heard from friends is never buy your man a pair of shoes, or he will walk out of your life forever! A few friends of mine bought shoes to their partners as a gift and ended up they were no longer together. What the..?!?! Could this be a connection or is it just a coincidence? Check out the long list of superstitions here. 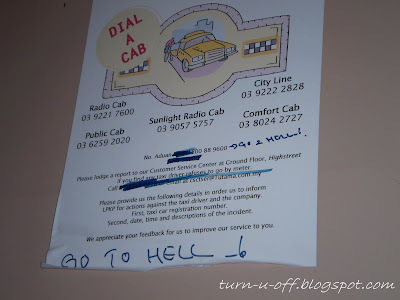 Cases or problems with taxi drivers are not new in the city of KL. Some drivers will not pick you up if they don't want to go to certain areas during peak hours or not in their directions. The worst part is overcharging tourists (and locals too). This is very common and it happens especially in areas full of tourists, particularly outside bars, shopping centres and hotels. Taxis are supposed, REQUIRED by law to run on meters but MANY of them refused to use their meters and fares are negotiated up front. I feel the responsibility to REMIND tourists (or locals too) in KL, do watch out and don't get cheated by those bad taxi drivers! They have no authority to charge you if their meter is not turned on. Find a driver who will use the meter. Of course, as anywhere else, there will be some bad "apples". Certainly not all. There are some good taxi drivers out there who are very pleasant and accommodating. Give your business to the honest one rather than forcing the dishonest one to play the rules. I am sure many people here have negative experiences with some taxi drivers. I have heard a lot. People have been cheated and ripped off. But, sadly, it is common as people won't usually make a fuss about that. (Click to enlarge). *I saw this in 1 Utama. * Now you tell me, how to make a complaint to LPKP? Has anyone actually tried to take down the registration number of the taxi, note the time, date and place, register your complaint and to get their licence revoked? Get your pen out next time when you are hailing a taxi. I wish something can be done to curb this issue. Government, please do something on this! By the way, do they know what is going on? Stayed at my home sweet home watching Astro, eating non-stop and chatting with everyone at home, visited some relatives, went to church, celebrated dearest mom's birthday earlier, had buffet lunch at Marco Polo Hotel, spent V-Day at home, went to salon, slept 10 hours everyday, couldn't blog, couldn't chat online... All I can say is, I have been spending quality time with my family for the past two weeks. Left Tawau on 20 Feb at 21.15 to Kuala Lumpur with a heavy ♥. Miss my dearest parents so much! I can't wait to hug them soon. Now, getting back to the REAL life again! 6 hours later, mybb's wallet was a few hundred ringgit lighter, after we came out from Isetan, Elianto, Jun-Saito, Romp, Nose, Metrojaya and Voir. Ouch! Our friend, Alvin supposed to come and join us but due to traffic congestion around Bukit Bintang area, hence he couldn't make it. Sungei Wang was really packed! We rest our tired legs stopped for dinner at U-Cafe. Grilled Satay Chicken Rice (RM11.90++). Too bit spicy for me, so I switched it with mybb. Honey Orange Chicken Rice (RM11.90++). I like this instead. Best of all, mybb was has always been very patient to shop around with me. Without him, I'll be ended up carrying armloads of shopping bags. No-no! Get in the festive mood with the Chinese New Year floral decorations while you are shopping at 1 Utama. We were thrilled and enjoyed with the performances of acrobatics show. Really impressed with the ability of the young performers.